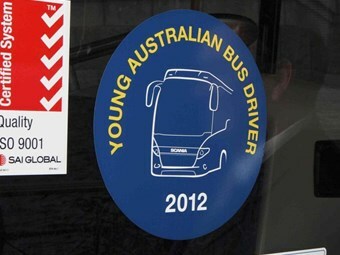 It could be a first for Australia as this weekend sees Melbourne’s iconic Flemington racecourse devoid of horses, but brimming with ‘bussies’ as young drivers from across Australia converge to compete for national honours as ‘Young Australian Bus Driver of the Year’. Convened and sponsored by Scania, 12 competitors – two of which have identified as female – are put through an intensive day-long competition, the winner taking home $10,000, with runner up heading to Adelaide for the Clipsal V8 Supercar race in March 2013, and third pocketing a $500 fuel voucher. But notwithstanding the prizes for the ‘best of the best’, the kudos as Australia’s best young bus driver is what the day is all about. The national final sets four main tasks – vehicle manoeuvring, on-road driving, a theoretical test of road and transport rules, and the ability to answer questions in a mock media interview, which will be a test of their ability as an industry ambassador. Scania Australia Managing Director Roger McCarthy says a key aim is to bolster community understanding that bus drivers are professional, skilled, courteous and safe. "It is also aimed at attracting young drivers to the profession," McCarthy says. "Our industry needs more people like the 12 finalists who quite clearly demonstrate they are motivated, self-confident and intelligent employees." He says Scania is very focussed on driver safety and driver comfort, and as a by-product of this, greater passenger safety and comfort. "The driver is absolutely the most important factor in both the safe and efficient operation of any bus or coach," says McCarthy. "Vehicles and infrastructure are obviously of major significance, but fuel-efficient and safe driving is primarily a matter of human behaviour." He says maintaining a sharp focus on fuel economy is increasingly relevant for bus operators. "Many are now taking a close interest in the weekly fuel performance of their vehicles and drivers. "As a result, more drivers understand the impact of fuel cost on their employers’ profitability." A key element of the YABD challenge is to highlight the importance of driver skill in achieving reduced fuel consumption, thereby lowering operating costs and reducing environmental impact. "A skilled driver can save substantial amounts of money for a bus operator," McCarthy says. Victorian bus industry veteran Ron Brien is chief judge for this weekend’s Young Australian Bus Driver event at Flemington.